May we help you? Please call us at (804) 730-4855. 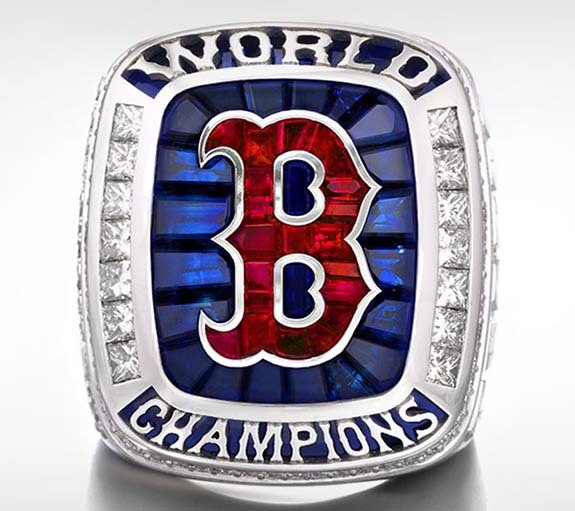 The iconic Boston “B” logo on the face of the 14-karat white gold ring is formed by 21 custom-cut genuine rubies, which represent the four World Series titles won by the Red Sox during the 17 seasons of Fenway Sports Group ownership. 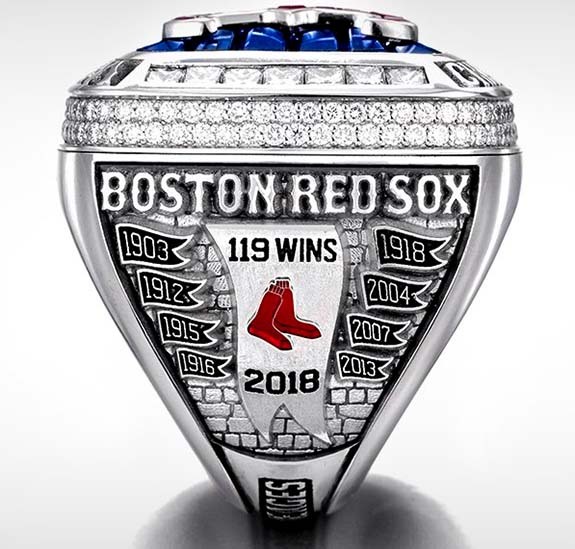 The logo is framed by 22 intricately set custom-cut blue sapphires, which represent the Red Sox’ 14 postseason games and eight home runs hit during the World Series against the Dodgers. 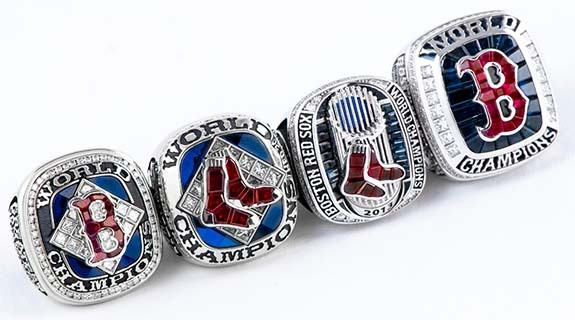 The left side of the ring displays eight pennants featuring the years of previous Red Sox World Series titles. The ninth and largest pennant pays tribute to 2018’s franchise-record wins and is punctuated by the famous double Sox logo. In another nod to the team’s championship history, the depiction of 100 individual weathered bricks of Fenway Park form the background of each side panel to celebrate the centennial of the famed 1918 World Series Championship. The name of each recipient appears on the ring’s right side, rendered in the Red Sox jersey font. 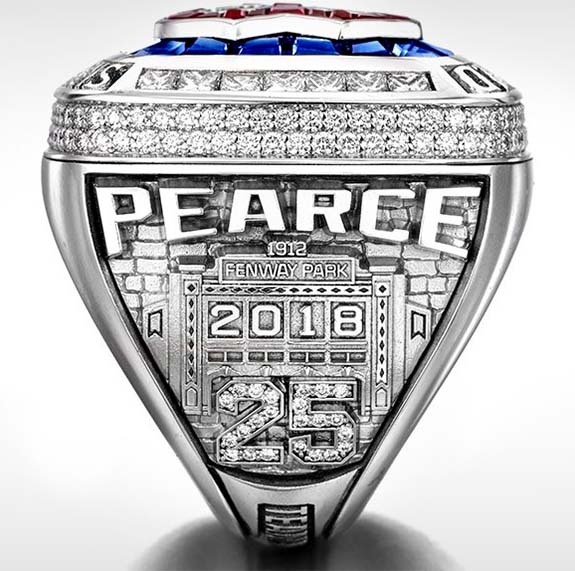 The ring belonging to Steve Pearce, the 2018 World Series MVP, showcases his jersey number 25 rendered in pavé-set diamonds. Pearce’s name and jersey number frame an intricately detailed façade of Fenway Park, the oldest ballpark in Major League Baseball. 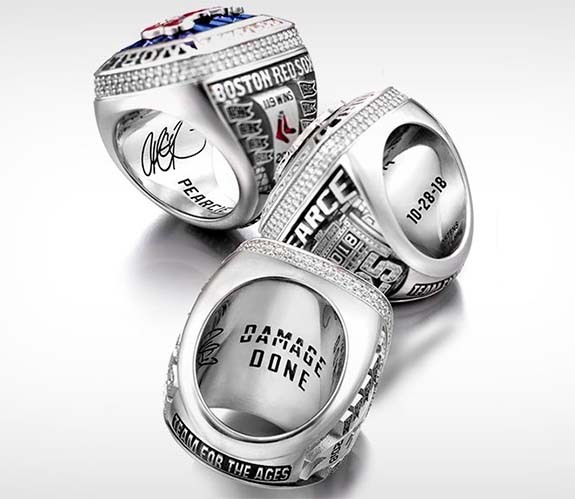 Inscribed on the interior of the ring is “10-28-18,” the date of the World Series victory and the date the team’s postseason slogan of “Do Damage” was changed to “Damage Done.” In recognition of the exceptional contributions of the players and the coaching staff, the declaration of DAMAGE DONE appears on the interior alongside each of their signatures and nicknames. Your neighborhood jeweler since 1991.